better handle challenging behavior and uncover developmental milestones through play. This is an excellent program and I would encourage you to check out the classes that are offered at no cost to you and your family. Below is the list of classes for December and January. How does ice melt? How and what do we pack for cold weather? Come learn how to better understand your child’s thinking and problem solving skills on this special Way to Play day. Time: Way to Play days occur on the second Friday of every month and last all day. Who is it for? Parents/caregivers and children ages birth to 5 years. Is there a fee? Way to Play day activities are included in museum admission. Just in time for the holidays, learn the appropriate toys to purchase for the little ones in your life that will help develop their brains while they play. Be one of the first 10 participants to RSVP and get a FREE brain-friendly toy from Lakeshore Learning . Class Time: 6:30 – 8:30 p.m.
Who is it for? Anyone who may be getting gifts for young children this holiday season (and beyond). How do I sign up and by when? Register online at http://pretendcity.org/g2g/event-calendar/ by Dec. 10, 2010. There is no cost to attend. Museum admission not required nor included. This demonstration is presented by Good To Go From Head To Toe and is facilitated by Regina Lamourelle, Ph.D. (frequent guest on PBS’ A Place of Our Own and founder of Brain Based Solutions & Strategies . Brett L. Patterson, Ph.D., Licensed Psychologist with CUIDAR . Children learn best by connecting and interacting through play. This interactive class will teach parents and caregivers how important play is and how to effectively play with their children to uncover developmental, language and social skills. Parents are introduced to Parent-Child Interaction Therapy (PCIT), which places an emphasis on improving the quality of the parent-child relationship and changing parent-child interaction patterns. Who is it for? Parents/caregivers and infants/toddlers. How do I sign up and by when? Register online at http://pretendcity.org/g2g/event-calendar/ by December 10, 2010. Reservations are required; 15 family maximum. This class is facilitated by the Child Guidance Center. · Why does my child throw tantrums and how can I prevent them? · Why doesn’t my child listen? · Is my child the only one who…? Class Time: 10:30 a.m. – 12 p.m.
How do I sign up and by when? Register online at http://pretendcity.org/g2g/event-calendar/ by December 29, 2010. Reservations are required; 15 family maximum. There is no cost to attend the class. Pretend City museum admission not required nor included. This series is facilitated by Dr. Ann Corwin, The Parenting Doctor (http://theparentingdoctor.com) and presented by Pretend City’s Child Development Initiative, Good to Go From Head To Toe. Learn to create the most supportive ways to ensure that children understand what is being asked of them and increase the likelihood that they will want to follow directions. One of the first 10 parents/caretakers to register will get a free developmental screening for their child. Class Time: 10:30 – 11:30 a.m.
How do I sign up and by when? Register online at http://pretendcity.org/g2g/event-calendar/ by Jan. 3. 2011. Reservations are required; 15 family maximum. and presented by Pretend City’s Child Development Initiative, Good to Go From Head To Toe. Time: Way to Play days occur on the second Friday of every month and last all day. Members only hours: 9 -10 a.m.
How do I sign up and by when? Register online at http://pretendcity.org/g2g/event-calendar/ by Jan. 18, 2011. Reservations are required; 15 family maximum. The holidays are in full swing and there is nothing quite like making a gingerbread house during the holidays. One of our favorite holiday traditions is making and decorating a gingerbread house with whatever we can find in our home that is edible . We buy our kit from Costco or Michael’s and love coming up with a wacky creation. The Discovery Science Center knows how much fun building a Gingerbread house can be and has created a fun exhibit called The Science of Gingerbread. 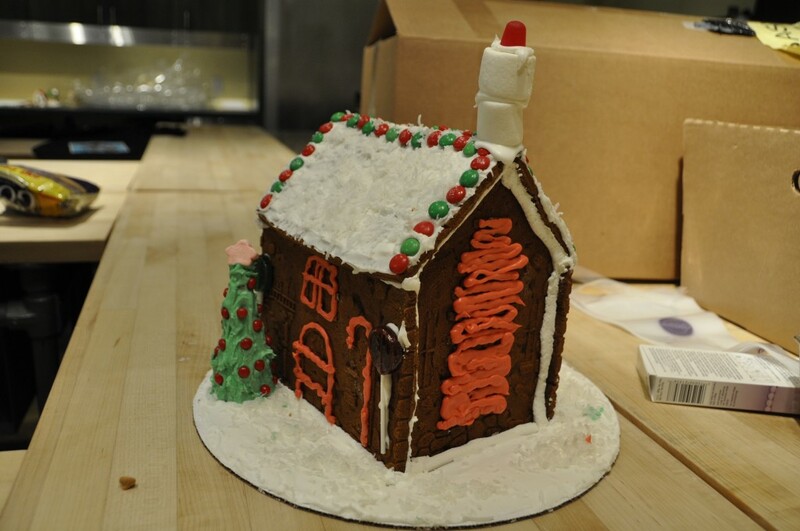 The exhibit takes you inside the kitchen and be able to explore the science at work of making a gingerbread house. There are also many fun holiday happenings at the Discovery Science Center including photos with Santa, a stage show, Gingerbread house workshops, cookie decorating and an award winning gingerbread display, which includes an entry for me. My gingerbread home is far from spectacular or award winning but it sure was fun to make. 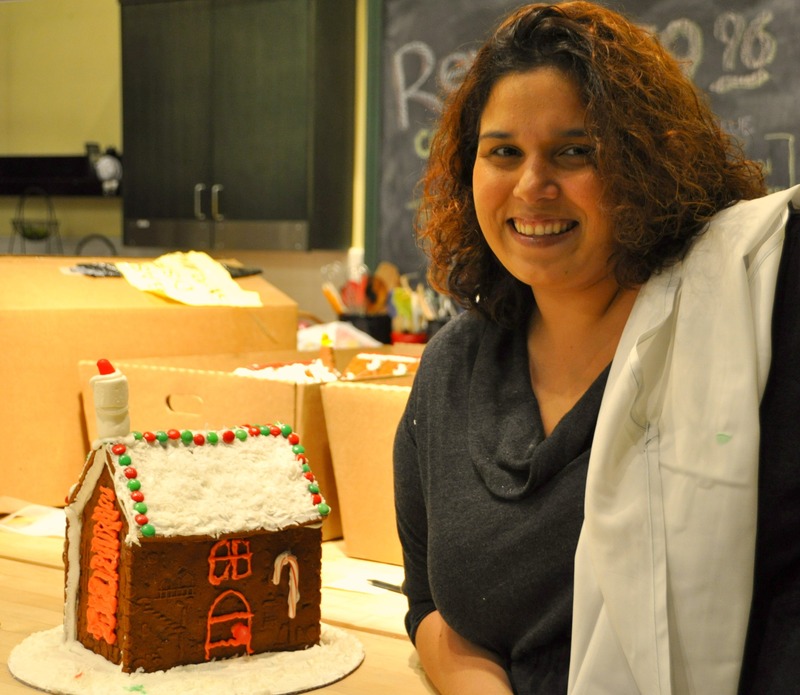 The Science of Gingerbread will be at the Discovery Science Center until January 2nd. 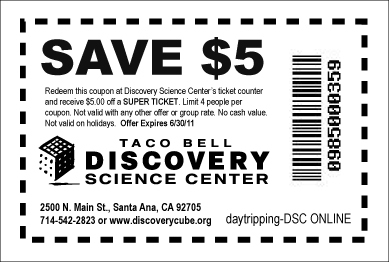 Make sure to take advantage and use this $5 off coupon on a super ticket. It’s giveaway time! We are giving away a family four pack of tickets to the Discovery Science Center. All you have to do is leave a comment on why you would like to win and you are automatically entered! You have until Sunday December 5th to enter. Winner will be chosen at random. Good luck! This entry was posted in Discovery Science Center and tagged discovery science center, giveaway, the sceince of gingerbread, things to do for Christmas, things to do orange county. Congrats Elizabeth! Email me at mom@daytrippingmom.com with your info. Thanks for entering and stay tuned for more fun giveaways!